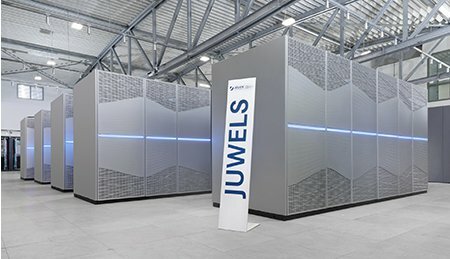 At the Jülich Supercomputing Centre (JSC) in Germany, the new modular Supercomputer JUWELS has been officially inaugurated by Germany's Federal Minister for Education and Research, Anja Karliczek and North Rhine-Westphalia’s Prime Minister Armin Laschet. Thomas Lippert, Director of JSC and leader of HBP’s High Performance Analytics & Computing Platform (HPAC) and the HBP Scientific Director Katrin Amunts explained the innovative computing concept of JUWELS and its usage in the HBP’s neuroscience research. As a German-French high-tech collaboration, JUWELS also marks an important step in European HPC development. JUWELS (short for Jülich Wizard for European Leadership Science) is a milestone on the road to a new generation of ultra-flexible modular supercomputers specially tailored to the requirements of modern simulation codes and targeting a broader range of tasks – from big data applications and compute-intensive simulations right up to the analysis of huge volumes of data or machine learning and artificial intelligence (AI). To meet such widely differing requirements, JUWELS has been designed as a modular supercomputer. “For us, modular supercomputing is the key to a forward-looking, affordable, and energy-efficient technology, which will facilitate the realization of forthcoming exascale systems”, said Prof. Lippert. In contrast to current massively parallel supercomputing architectures that consist of large amounts of identical clusters, modular supercomputing is a new paradigm directly reflecting the diversity of execution characteristics, found in modern simulation codes, in the architecture of the supercomputer. The flexible design conceived by Lippert developed into an extensive European undertaking years ago and from 2011 on was turned into a reality in the EU research project DEEP. Instead of a homogeneous design, various types of modules with distinct hardware characteristics are exposed via a homogeneous global software layer that enables dynamical resource assignment, so that their individual advantages can be exploited.